We may not know what time is, but from a “big date” to finding ship’s position, we reckon it with care and precision. Knowing time remains as essential to getting GPS position in the 21st century as it became for finding longitude at sea in the 18th century. There is a simpler way. Stay in one place. As the world turns, days pass by. This is our starting atavistic expectation of time. But, get in a plane during the day, fly west at the speed of the earth’s rotation (about 1,000 mph at the equator), and the sun will never move from your sight. All easting and westing, at any speed, distorts the opportunity to measure time through the observation of the sun. After a westward circumnavigation of the earth, Magellan’s crew was surprised to find when comparing ship’s log with home calendars, that they had lost a day. Upon completing his easting Around the World in 80 Days, Phileas Fogg was surprised to find he had gained a day. This is not about Einstein’s Theories of Relativity, but it is about relative motion. As a child my father perplexed me by saying that if one traveled west faster than the sun then one would go back in time. I knew this was false, but I did not know how to prove it. I observed that moving westward on a train, I had to periodically set my watch back an hour and, each time, that made my day an hour longer. I wondered what would happen if one kept this up forever. NOTE: Relative motion matters to boaters because this is what they focus on when determining whether the constant velocity (course and speed) of one vessel and that of another will put them in the same place at the same time. This is why it is wrong (potentially leading to unlawfully dangerous action) to think of any vessel as having “right of way.” The correct term, with completely different meaning, is “Stand-on” vessel (as defined by 72 COLREGS – Navigation Rules) which has a legal duty to “keep her course and speed” until released from that duty or required to act differently to avoid collision (as defined by the COLREGS). Why? Because unless the “Stand-on” vessel fulfills her duty to keep her course and speed (while it is still safe to do so), it becomes difficult or impossible for the “Give-way vessel” to calculate what she needs to do to avoid collision. See movie LA Story where four cars at four-way stop first all try to politely be the give-way car and then all decide simultaneously to be the go-ahead car. Returning now to time. What befuddled Fogg and Magellan was their failure to consider their own motion relative to the sun’s apparent motion. Imagine a world without the conventions of time zones and International Date Line. If you leave at noon circumnavigating westward at the speed of the sun, you will be at noon the whole trip but when you get home, your village will have seen noon pass by and return. Their calendar will be a day later. At any speed, you gain hours of sun as you travel west. You can return home either by going east or by continuing west for a circumnavigation. With an easterly return you give up all the hours gained while westing. With circumnavigation you gain 24 hours of sun time and periodically set your watch back to coordinate its noon with when the sun is overhead. Your journey calendar will end up 1 day behind the calendar of your home. If you do not like the math, think of it as only fair. You gain hours traveling west so at some point you have to give them back. That can be done by losing a day. The opposite when traveling east, you lose hours and at some point you get them back. What is the “some point” referred to above? There must be a reckoning for a day, but the math does not care where that is done. You could wait until you get home or you could do it when halfway around the world. Here is another way to grasp the problem. Look down on the earth from above the North Pole. Notice how midnight circles the earth every 24 hours, wiping away the old day and painting on the new one. At all times, it is midnight somewhere with a different day on each side of it. ​In the figure below, the red line on the equator (and all other parallels of the globe) represents midnight which rotates east to west (clockwise) about the equator as seen from above the North Pole. Before midnight passes you, it is New Year’s Eve. After midnight passes it is New Year’s Day. But there is a problem. We need another line somewhere, anywhere, so there can be two boundaries to contain each of the two dates. The math would be happy to have the line anywhere, as long as it is defined. It has been found convenient to put the line halfway around the world from Greenwich, England in an area which is mostly ocean. It is called the International Date Line. It is not really international in that every jurisdiction has freedom to declare any date they like for their country. The so called “line” is free to zig and zag and even encircle countries as they decide what date they want to use. Kiribati changed its date so as to be first instead of last to greet the new millennium. That resulted in its having a new time zone of +14 instead of its old time zone of -10. Note the difference is 24 hours which makes for 1 day. Note the extent to which the line deviates from the 180 degree meridian. Where the dateline behaves normally, the instructions below will suffice. Eastward subtract 24 hours. Westward add 24 hours. The line itself is not needed. It is easier to convert time zones. The Marshall Islands are Zone +12. Baker Island is Zone -12. To go east from +12 to -12 there is a total change of -24. That results in setting the calendar back 1 day and gaining 1 day when going eastward. In the opposite direction from -12 to +12 there is a total change of +24. That results in setting the calendar ahead 1 day and losing a day when going westward. Suppose it is 1 pm in San Diego (Zone -8) on Monday. 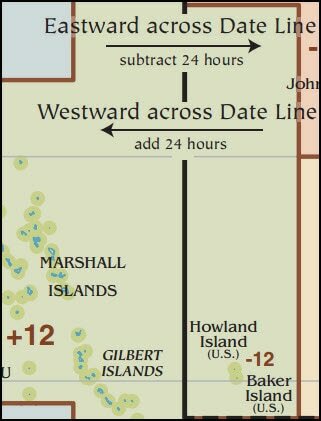 You want to know the date and time in the Kiribati Line Islands (Zone +14). Do the time zone conversion and the date will follow. From -8 to +14 is a change of +22. So add 22 to 1 pm. Do this in 2 steps. Add 11 hours to get to midnight and thus the next day, Tuesday. Then add 11 more hours to get to 11 am on Tuesday. Before the date line change, the Kiribati Line Islands were in Zone -10. From -8 to -10 would have been a reduction of 2 hours from 1 pm to 11 am on Monday. Wikipedia points out that it is possible to simultaneously have three different dates in the world. This is because of the bending of the so-called date line. The best method to calculate is again by time zone difference while forgetting about date line. Start with 10:01 am on Thursday at UTC (Zone 0, Greenwich, England). Find time in American Samoa (Zone -11). From 0 to -11 is a change of -11 which is 11:01 pm Wednesday because in subtracting 11 hours from 10:01 am, we pass backwards over midnight. Find time in Kiribati, Line Islands (+14). From 0 to +14 is a change of +14 which is 12:01 am Friday because in adding 14 hours we pass forward over midnight. 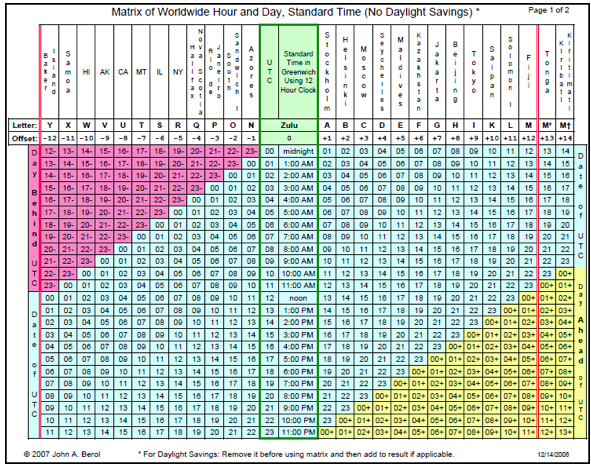 Remove daylight savings (subtract 1 hour, “fall back”) wherever used. Calculate hour difference between time zones (see examples above). The dates will adjust automatically with correct math. Add daylight saving back if applicable (add 1 hour, “spring forward”). ​Click here for a 2 page chart. Page 1 permits calculations by table. Page 2 gives examples of time zones. Convert April 29 at 5:01 pm San Diego to Fiji date and time. 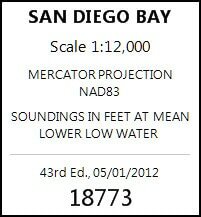 Look on page 2 and see that San Diego is Zone -8 (U) and Fiji is Zone +12 (M). Start with 5:01 pm DST and subtract 1 hour to get 4:01 pm standard time. Add 12 hours for 24 hour time of 1601. Find 16 in column for zone -8 (U). It is marked as 16- in pink to show it is a day behind UTC which means UTC is a day ahead of it. Look to right in UTC column and see it is “00 midnight.” Therefore April 29 at 5:01 pm DST in San Diego is April 30 at 0001 UTC. Keep in this same time row going right to the column of +12 (M) Fiji and find 12. Therefore Fiji in standard time is 1201 or 12:01 pm. 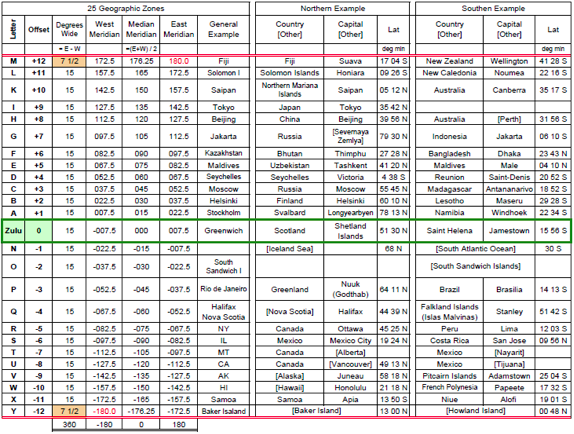 Look on Page 2 to see that Fiji is below the equator (lat. 17 deg. s) so it has winter when San Diego has summer. Internet search confirms hunch that Fiji does not have Daylight Savings Time on April 30, so the answer remains as 12:01 pm on April 30. Internet confirms this is correct, but no internet or computer is needed with the 2-page chart available here for printing with the permission of author. Consider again the 10:01 am example shown by Wikipedia when there are three dates in the world at the same instant. This can be seen on Page 1 of the above chart by looking at 10 am UTC and noting that at that time it is 1 day earlier (pink 23-) in Zone -11 (X) and 1 day later (yellow 00+) in Zone +14 (M †). This only happens because of the new times zones +13 and +14. The result is that the date line is no longer as simple as adding or subtracting 1 day. If it were 11:01 pm in America Samoa (Zone -11), and you were able to jump in 10 minutes to Kiribati (Zone +14), your watch would read 11:11 pm. Then you would need to advance your watch and calendar by 25 hours putting you at the hour of 11 minutes after midnight two days later. One day for the movement past midnight and 1 day because Kiribati advanced itself ahead a day from what would be expected by a normal date line. ​Accordingly, the International Date Line is none of the three things implied by its name. It is not international because time is decided by local politics. It is not a single date change because in theory there could be a 2-day change when crossing. It is not a line because it zigs and zags and potentially could be discontinuous according to the whim of localities. But you still must change your ship’s calendar at some point when circumnavigating the globe. Mathematician David Darling explains “there’s no way to continuously map points on a real number line onto a circle” as shown by “the “Borsuk-Ulam theorem in one dimension.” “The International Date Line is needed ... (because it) takes care of the inevitable discontinuity by having it happen all at once, as a jump by one whole day, on a longitude that passes mostly through open water in the Pacific.” The Universal Book of Mathematics: From Abracadabra to Zeno's Paradoxes by David Darling. Here is a video explanation of that theorem. The part about temperature (single dimension) is relevant. The video shows that on an instantaneous trip about the equator, assuming that temperature change from point to point is continuous, then there must be two antipodal points with the same temperature. 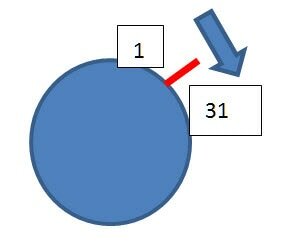 Two antipodal points are defined as diametrically opposed points which means points connected by a diameter which means points connected by a line running through the center of the earth. Time to flow continuously as it does on a real number line from starting point to infinity with possibility for an infinite number of ever smaller divisions of measurement between points of that line. keep to the convention of clock noon fitting with sun noon. These two wants create a continuity which can not work on a circle in which any circumnavigation starts and ends at the same point of a circle. A discontinuity must be introduced. The Time Line does so. While there must be a discontinuity, it need not be a line drawn on the map. The system of times zones flowing as +1, +2 to +12 in one direction from the Prime Meridian and -1, -2, to -12 in the other direction automatically create the necessary discontinuity. Movement between the neighboring -12 and +12 zones creates a discontinuity of a time zone change of 24 hours. In all other movements between time zones the time zone change is 1 hour. We could go to 48 zones of 30 minutes each with -24 and +24 as neighbors. There would still be a difference between these discontinuous neighbors equal to 48 times 30/60 which is still 24 hours. Or go to times zones as small as you like and the discontinuity would still be handled as 1 day of 24 hours. We need agreement on time to navigate and coordinate activities including rescues. See UTC as a great convenience and safety mechanism rather than an irritating strange number for converting to local time. Ships should keep a clock set to UTC or at least keep in their log the difference between their current settings of GPS devices, watches, clocks etc. and UTC. There is possibility of trying to have extra safety with several GPS devices, but they are all inadvertently programed for different local times. There is no other way to assure coordination between you and the world outside your ship whether that be a rescuer or navigation by celestial objects. UTC is simple. Everyone agrees on what it is. It flows second by second in only one direction. There are no time zone shifts and no date shifts to make mistakes with. Local time can take care of itself. When you stop on an island, you can ask locals what they are using for date and the time. For all you know they might have changed their clocks and date by a new law passed while you were at sea. If you lose track of UTC, that could be a big problem. You do not really need to know local time until you are catching an airplane home. Then you can ask. UTC stands for Coordinated Universal Time. It is our primary time standard, not a time zone. It happens that when people in Greenwich, England are not using Daylight Savings Time, then their time zone (0 or Z or Zulu or GMT) has the same time (as a practical matter) as UTC. UTC gets adjusted by a second from time to time to coordinate with the sun. Other time standards may not do this so as to keep them simpler and more consistent. Time is always measured by repletion of cyclic events. The cycle of the earth’s rotation, the cycle of the moon, the ticking of a clock, the swing of a pendulum, the hum of a tuning fork. UTC is maintained by observing the resonance frequency of the cesium atom. ​When you need to communicate with others about the world, coordinating your plans by UTC is the easiest way to avoid making a computational error. To convert to local time and date, add or subtract the local zone and then if applicable add 1 hour for daylight savings. It is often said that the moon rises, on average, about 50 minutes later each day. Let’s examine all moon rising times shown in the 2017 table for San Diego created with data from the Astronomical Applications Department of the U.S. Naval Observatory. On average during the year, each rising time is 24 hours and 50 minutes greater than the previous one. In non-leap year 2017, there are 365 * 24 = 8,760 hours. Dividing that result by the average time between moon risings (24 + 50/60 hours) gives an expected total of 353 moon risings in a year which is what one finds on the year 2017 table. Looking at the 352 actual time differences between the successive moon risings, one finds the shortest time of lateness is 34 minutes and the longest is 66 minutes. That is a much wider range of lateness minutes than I had expected. Below is a graph of the lateness minutes of moon risings in year 2017. The maximum of 66 minutes is circled in red where it occurs on 3 dates. The minimum of 34 minutes is circled in green. The average of 50 is shown with a gold line. Knowing range allows for a fuller understanding than does average alone. 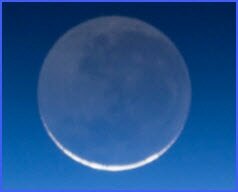 Recently while looking at a crescent moon at sunset, someone asked me: waxing or waning? To my great chagrin, my answer was wrong. If I had noticed a new moon on a previous day, then the answer would obviously be waxing. But there’s another way to get the correct answer. 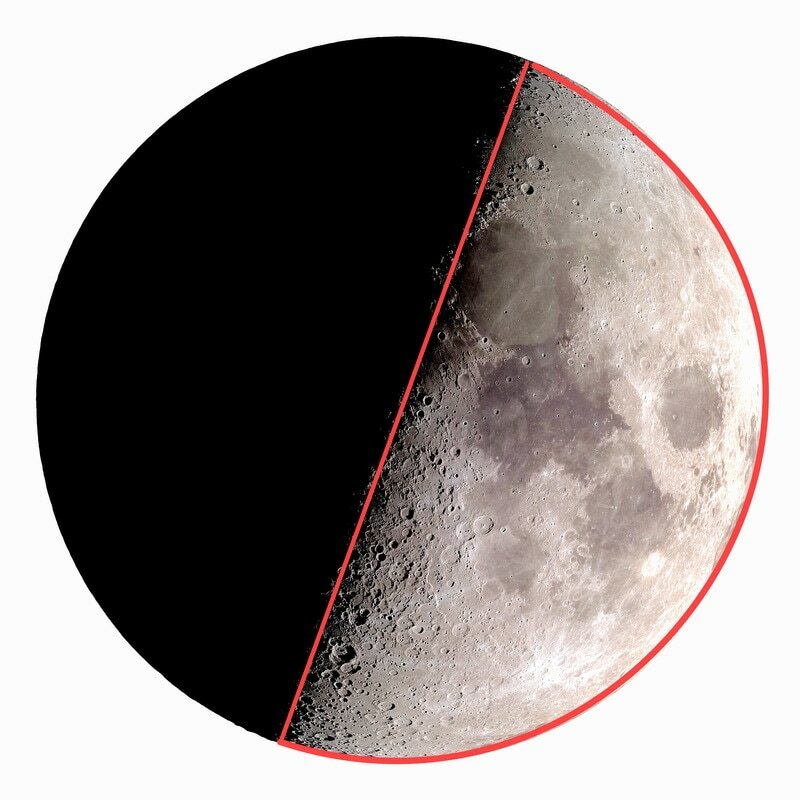 When seen about the time of sunset, the moon is always waxing, and a quarter moon is always 1st quarter. 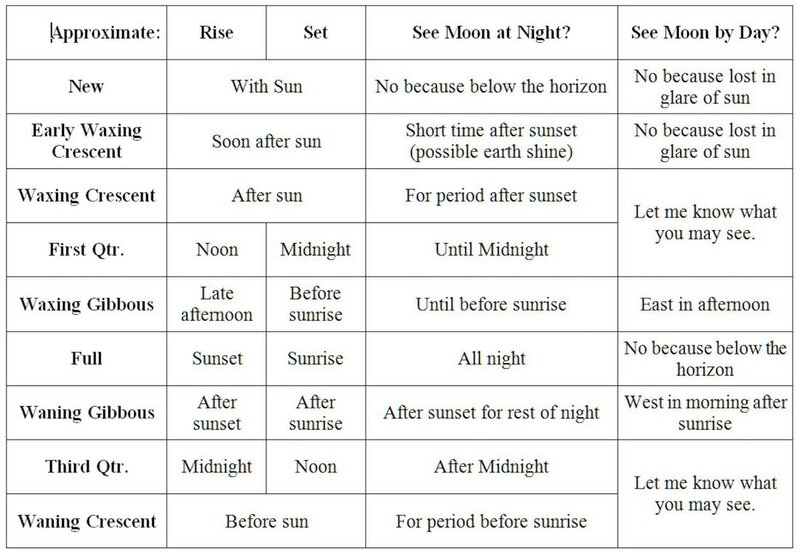 Whatever moon phase that you see about the time of sunset, you can be sure that at the next sunset, the moon will illuminate more area until it gets to full. 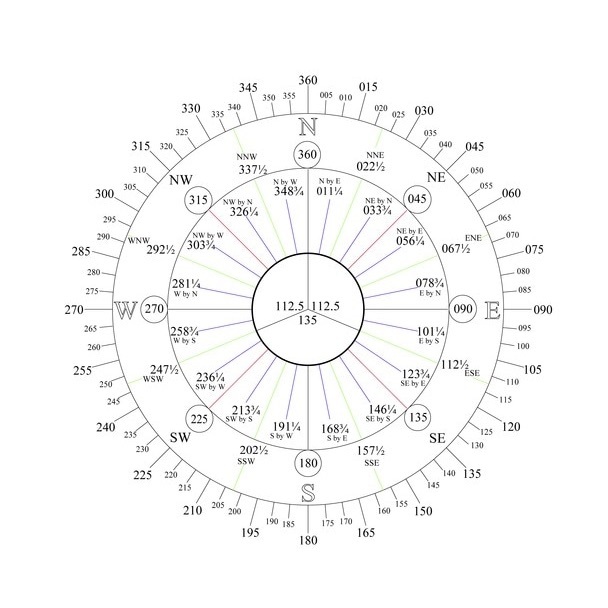 This diagram shows the range of possible moon phases at sunset. Imagine yourself at the center bottom dot of this and the other diagrams. 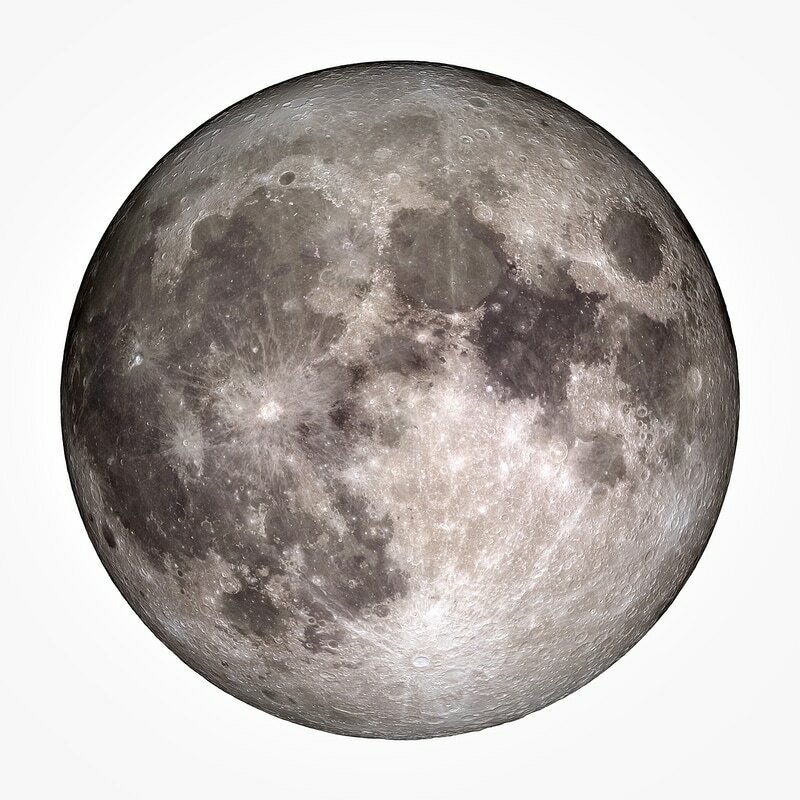 Check the post of 3/24 for moon images. 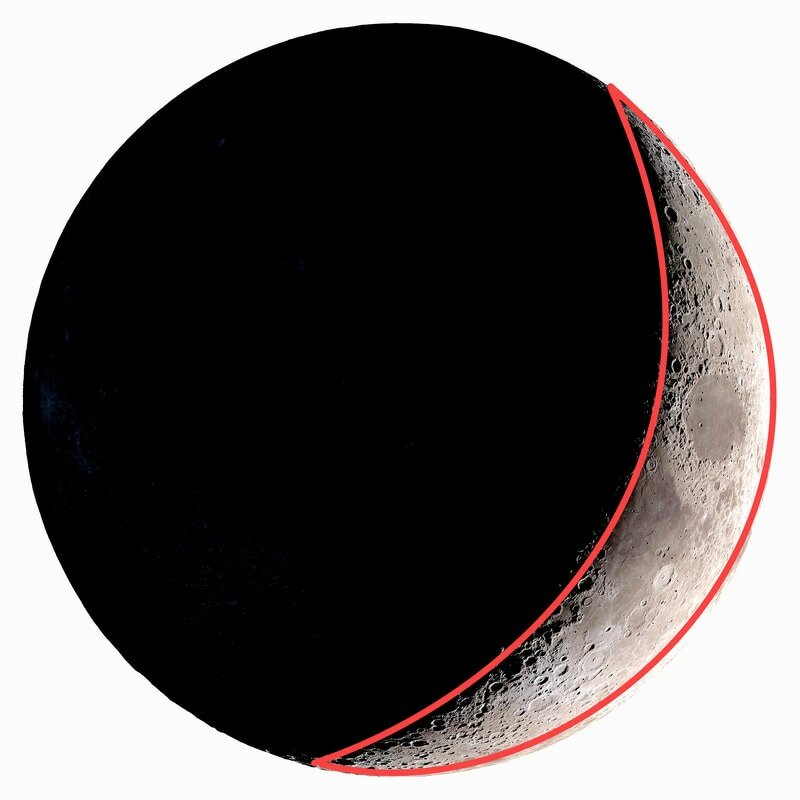 When seen about the time of sunrise, the moon is always waning and a quarter moon is always 3rd quarter. 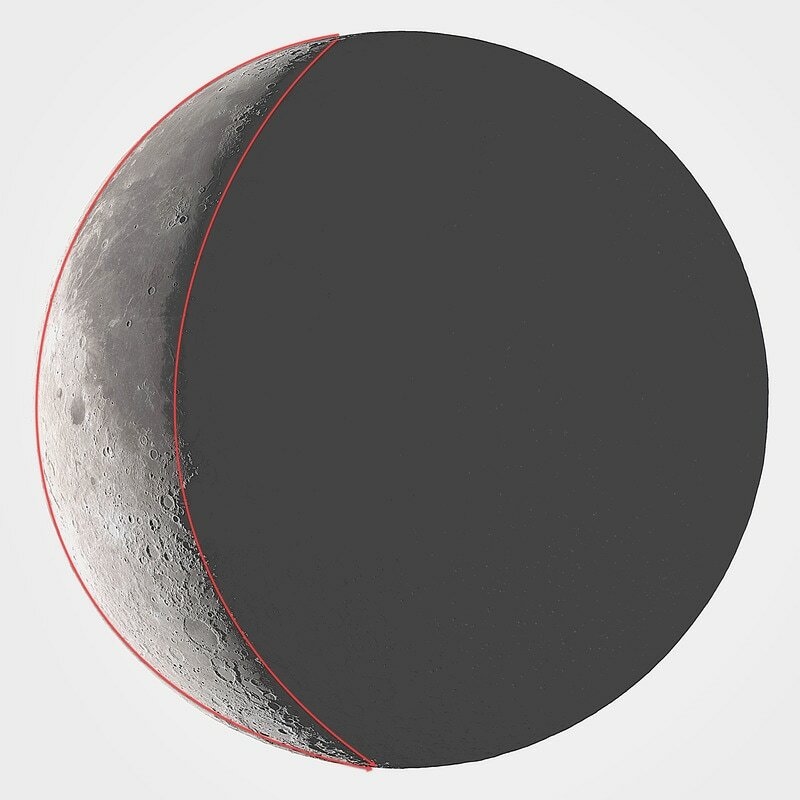 Whatever moon phase you see about the time of sunrise, you can be sure that at the next sunrise the moon will illuminate less area until it gets to new. At midnight if the moon is in the east (rising) then it is waning; if it is in the west (setting) then it is waxing. 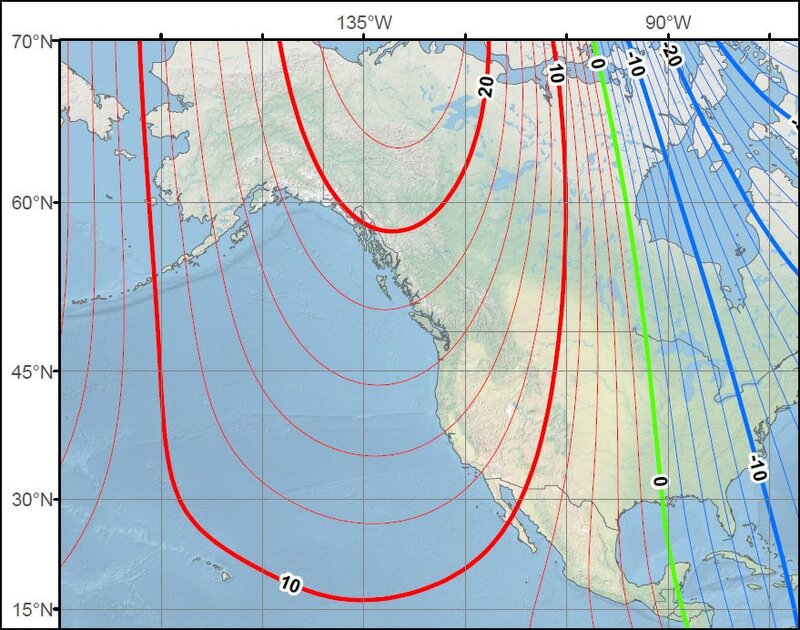 ​This shows the range of possible moon phases at midnight. Sailing to Santa Cruz Island and going ashore to the Nature Conservancy’s private wilderness portion of the island is a privilege as well as a fabulous experience. Each person must also have obtained, printed, signed, copied, and returned The Nature Conservancy Acknowledgment, Release, and Indemnification form to the address on the landing permit. In addition to sending it, you must also keep a copy as proof. This becomes your “ticket,” and you won’t be allowed ashore unless you have it. Here is a summary for Celtic Song crew to help with — not replace — reading the form and its rules. This is not meant as advice, interpretation or a legal opinion. You could be injured or take ill in a way that could cost you your life or cost lifetime expenses for medical care. Steep cliffs, slippery rocks and soils, landslides. (People have died). Rodents with diseases including hantavirus. Anyone who comes into contact with rodents that carry hantavirus is at risk of Hantavirus Pulmonary Syndrome or HPS, a severe, sometimes fatal, respiratory disease in humans caused by infection with a hantavirus. Wild animals, mold, yellow jackets, bees, ticks. Falling branches. Example of fatality from tree in San Diego. Cactus spines, poison oak, stinging nettles. The Nature Conservancy will not pay you anything if you are injured or killed on the SCI Preserve (release of liability) and you will reimburse it and those associated with it for claims made against them by others because of your actions on or about the SCI Preserve (indemnification). SUMMARY OF RULES for use of the SCI Preserve. (Please read the actual rules). Remove dirt, seeds and insects from shoes etc. before arriving at island. Prohibited Items: cardboard (because it can harbor insects), pets, plants, unprocessed wood, fireworks, firearms, weapons, bicycles. Leaving any of your stuff behind on the island. Examples: Orange peels or paper (unsightly), apple cores (seeds), plastic (environment). Collecting (taking) any of the island stuff such as flowers or rocks. Entry to the central valley of the island including Christy Beach area at the west end of island and Canada del Puerto road located to the south of Prisoners’ Harbor at the east end of the preserve. See landing permit map. Fire, cooking, smoking (fire hazard). Note: Cooking onboard vessel is OK. Entering into any structure (building). O, swear not by the moon, the fickle moon, the inconstant moon, that monthly changes in her circle orb, Lest that thy love prove likewise variable –- Shakespeare's Juliet speaking to Romeo, Act 2, Scene 2. Inconstant Moon or in Her Proper Sphere? 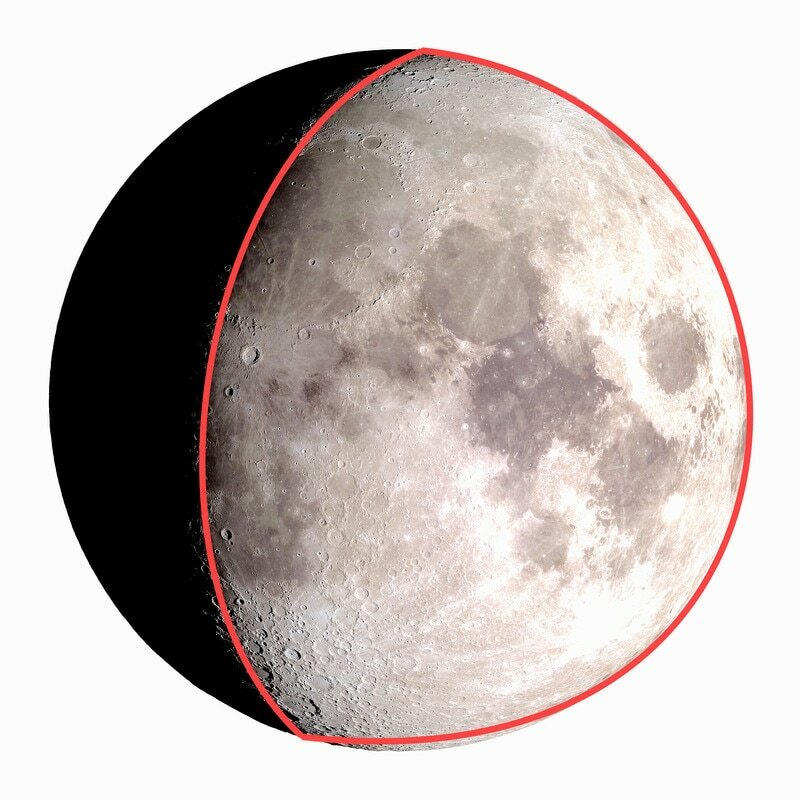 To understand the moon’s predictably peripatetic motion, let’s first focus on the eastward (west to east) rotation of the earth. Later we will look at how this affects apparent movement of sun and moon, and, in a future topic, the actual movement of tides and winds (Coriolis effect). We are setting a foundation for understanding time zones, International Dateline, moon, tides, and weather. It all starts with the earth’s rotation. After night, we see the sun rise in the east because we move with the earth eastward toward sunlight. After noon, our eastward journey takes us away from the sun until the western horizon rises up to obscure the sun at nightfall. In contrast to this actual earth rotation, we experience an apparent transit of sun moving westward (east to west) rising from the east and setting in the west. While we know the earth is moving eastward, it is convenient and conventional to speak of the sun transiting westward. The moon also rises and sets. The moon, like the sun, rises in the east and sets in the west. If you see the moon above the eastern horizon, it must be rising. If you see the moon above the western horizon, it must be setting. The apparent motion is always from east to west. If that seems too obvious to say, consider this tale of my confusion. On night watch in 2006 on a voyage to the Marquesas, I saw predawn clouds glowing red, and immediately thought of welcoming dawn. The moon, having been hidden all night by storm clouds, was not on my mind. Slowly, to my sleep deprived mind, the “dawn” I was expecting was occurring in the west. Had I missed a gap of time, was this sunset instead of dawn? All I could think of was the sun. It felt like the end of the world.“What is going on?” I asked myself. Slowly the facts became clear. The storm clouds had parted at the western horizon, revealing a blood red full moon setting there. Soon after on the eastern horizon came rosy-fingered dawn (The Odyssey). There had been no apocalypse when “the sun became black as sackcloth of hair, and the moon became as blood; And the stars of heaven fell unto the earth.” (Revelation 6, 12 & 13, King James translation). Let us now compare sun with moon. By dictionary definition, one day is 24 hours from one midnight to the next. One sunrise and one sunset occur each 24 hours. Seeing when the sun is above the horizon is as obvious as the difference between night and day. The moon rises about 50 minutes later each day. Either think of it as lazy or understand that the earth rotates a little more than one full rotation to go from one moonrise to the next. Generally one moonrise and one moonset occur each day. Some days miss a rise or a set. What is missing can be found soon after midnight within the first hour of the next calendar day. As days progress, the moon rises later each day. The time of rising will move backwards though all 24 hours of nighttime and daylight. 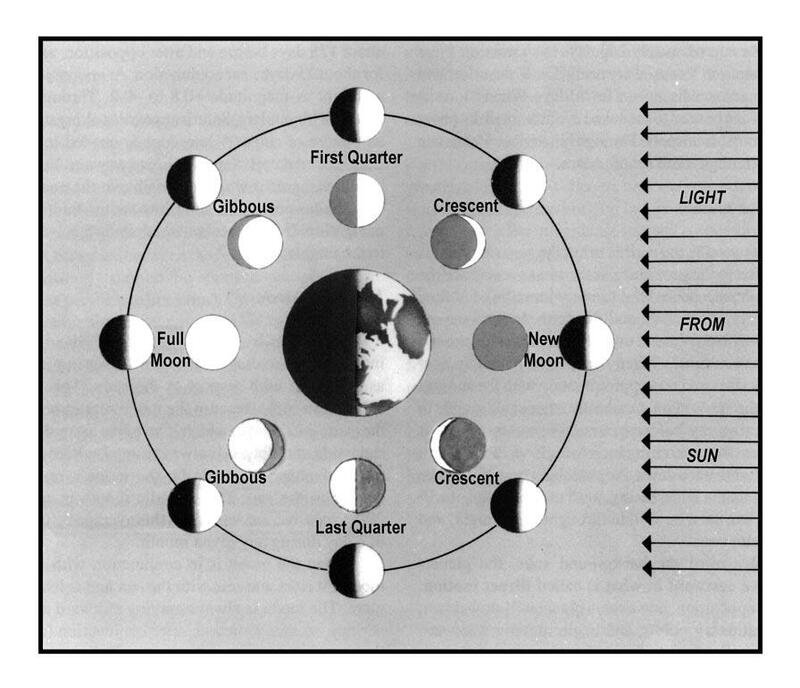 The moon revolves about the earth creating moon phases described below. Here is a sequence of moon phases. New – Not visible. Up all day. Rises and sets with the sun. Early WAXING CRESCENT. Rises soon after sunrise and sets soon after sunset. Here after sunset with earthshine (light reflected from earth). WAXING CRESCENT. Rises before noon and sets before midnight. FIRST QUARTER. 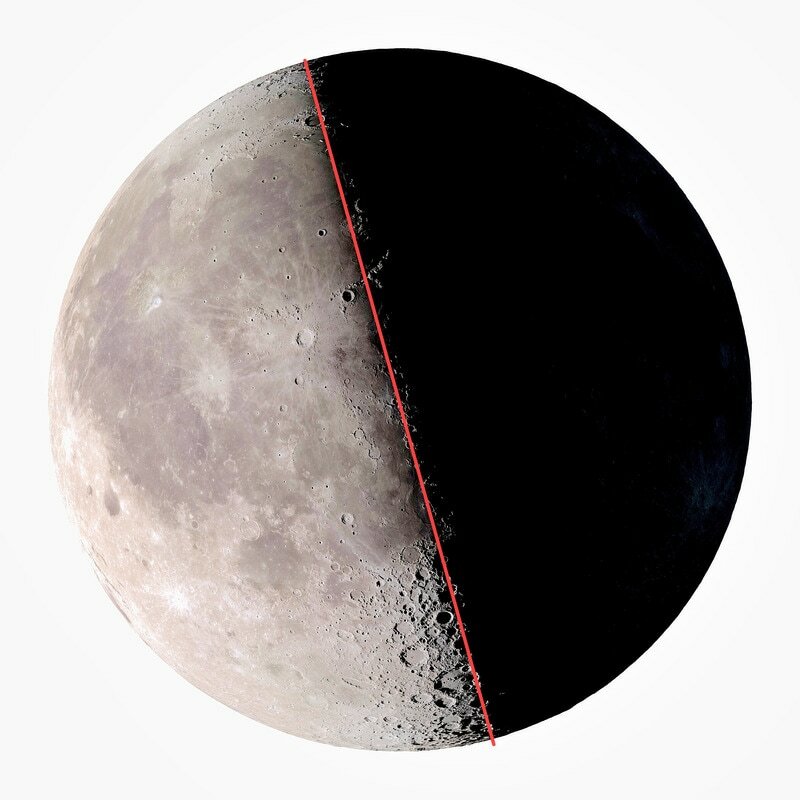 While one half of the whole moon is receiving sunlight, half of that sunlit moon is on the far side of the moon not visible to earth. From earth, only a quarter of the moon is seen in sunlight. Think of a quarter section of an orange. Rises at noon, highest at sunset, sets around midnight. WAXING GIBBOUS. Rises in late afternoon before sunset. Up through most of the night. Sets before sunrise. To see it in daylight, look to the east in the afternoon to see it rising. FULL. Up all night from sunset to sunrise. The entire earth facing hemisphere is sunlit. WANING GIBBOUS. Rises after sunset and is up for the rest of the night and into the morning. Sets after sunrise. To see it in daylight, look west after sunrise before it sets. THIRD QUARTER. Rises at midnight, highest at sunrise, sets around noon. WANING CRESCENT. Rises before dawn and is up for most of the day, setting before sunset. as copied below with permission for non-commercial use. 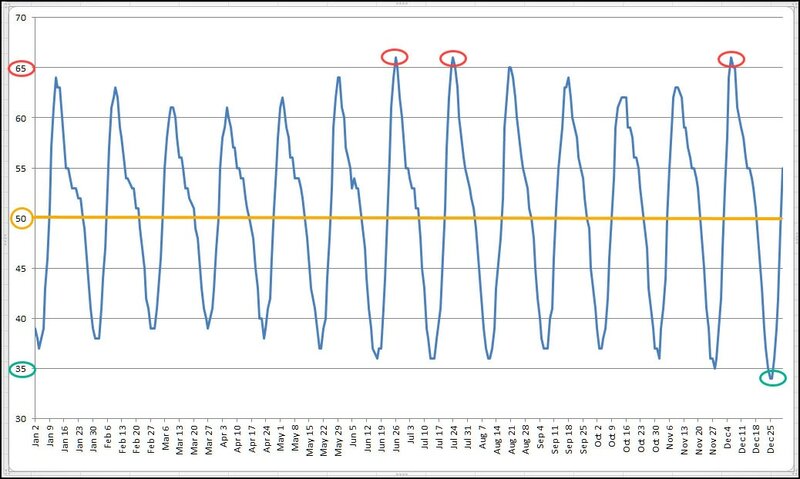 What matters for tides is to see that with a New Moon and Full Moon the moon and sun are on the same line which makes for greater tidal change (spring tide). The name for this with a New Moon is “conjunction” (moon between sun and earth) and the name with Full Moon is “opposition” (moon on opposite side of earth from sun). The quarter moons are at a right angle to line between earth and sun (quadrature) making for least tidal change (neap tide). 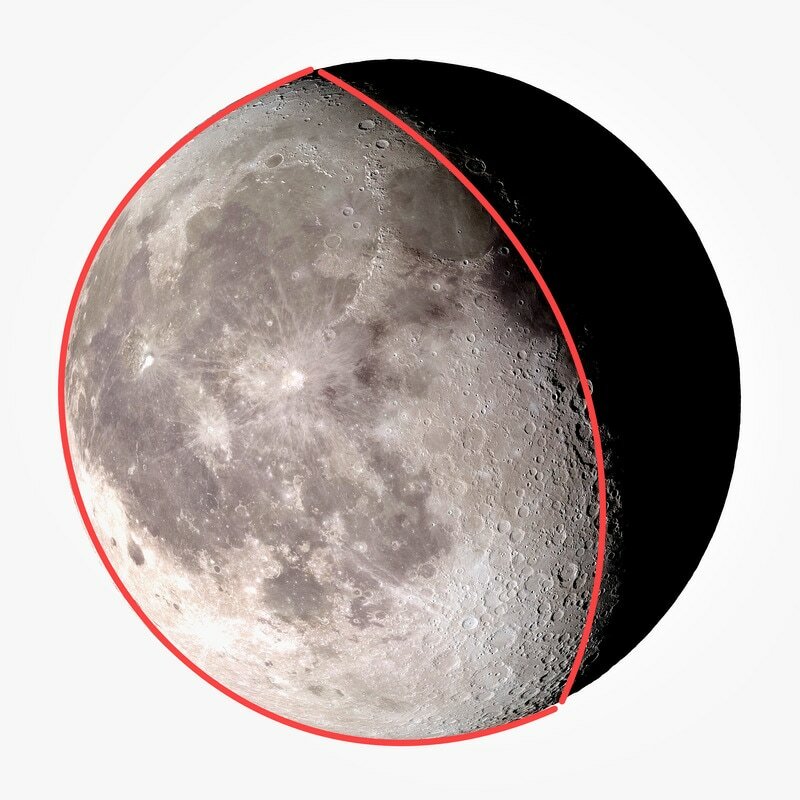 If the illuminated portion of the moon as seen from Southern Hemisphere is on the left side of moon, then in the Northern Hemisphere it will be seen on the right, and vice versa. The confusion of perspective is why starboard is a name used for an actual side of a boat as compared with the concept of “right” which changes with the perspective of the observer. Avoiding confusion is critical in avoiding collisions at sea. ​Cyclones spin in opposite directions on opposite sides of the equator. This is something to examine in future articles. When I was 12, my father ordered a 30-foot Chris Craft cabin cruiser to be christened Jaunty June in honor of my mother who, as it happened, never much enjoyed life on a boat. For me the boat became a ticket to summer adventures from New York City to Maine by sea and to Canada by Hudson River, Lake Champlain, and upstate canals and locks. I always remembered, but never understood, what that meant until after his death when I studied navigation during the year Celtic Song was being built in Orange County. Finding North by the North Star (Polaris) is easy. Look up in the night sky. The North Pole is located directly below Polaris. There lies North. This works in the Northern Hemisphere for the period from Shakespeare’s time through the 21st century. In 3,200 years, a new pole star will be needed because of the precession of the Earth’s axis (wobbling like a top). If you sail south from the Northern Hemisphere, night by night you will see the height of Polaris fall towards the horizon until it disappears as you pass over the equator. That’s what I saw on a voyage from Puerta Vallarta, Mexico to Hiva Oa of the Marquesas in French Polynesia. 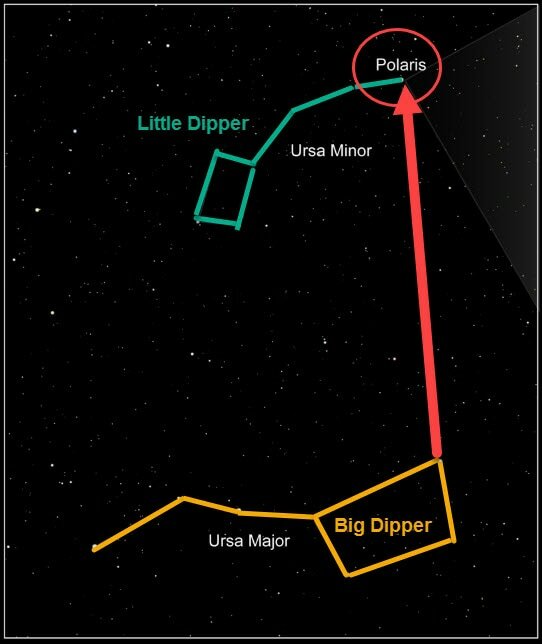 On any clear night in the Northern Hemisphere, you can estimate latitude by observing the angle of Polaris above the horizon. At 90 degrees, you are at the North Pole. At zero degrees, you are somewhere on the 24,901-mile equator. After you pass over the equator to the Southern Hemisphere, you find the South Pole by using the Southern Cross. You can research that and teach it to me. ​When you know where north is, you can hold a circle of directions (known as rose of the winds or compass rose) parallel to the sea with the line marked north pointing to north so that by looking at the circle you can see which way lies every other direction (east, south, west). In the accompanying compass rose that I created for Celtic Song, 112.5 degrees represents the angle in which the green starboard navigation light shines from dead ahead to “two points abaft the starboard beam.” With 32 points in 360 degrees, each point is 11.25 degrees. Starting from dead ahead, the starboard beam sits at 90 degrees. Two points more add 22.5 degrees giving an angle of 112.5 degrees. Today the COLREGS use the phrase “22.5 degrees” in nine places. Why an angle in fractional degrees? Because the rule’s angle remains constant while the unit of measurement has changed from points to degrees. Also, after subtracting 112.5 degrees on starboard and 112.5 on port, 135 degrees remain across the stern. This is the angle of white stern light. It is the angle an approaching vessel is, under the COLREGS, an overtaking vessel. ​I always keep the Celtic Song compass rose on the navigation desk to help translate a bearing from a number of degrees (as received from the AIS) to a graphic bearing line on the chart plotter or on a paper chart. Let’s focus on a portion of the world shown in the upper right. The magnetic 12 east variation line (red thin above red bold) runs approximately through San Diego and the Aleutian Islands. The 20 east variation line (red bold) touches down to the Gulf of Alaska north of Glacier Bay. The zero variation line (green) cuts through the Midwest of the U.S. running into the Gulf of Mexico at about New Orleans. The 10 west variation line (-10 blue bold) cuts into the Eastern Seaboard in the Mid Atlantic states. In about 5 years, at 6 minutes of angle a year, the decrease is 30 minutes of angle — 30 divided by 60 or 0.5 degrees of angle. So the variation in San Diego on Jan. 1, 2017 is about 12 degrees East minus 0.5 degrees East or 11.5 degrees East. Enter latitude and longitude of Harbor Island fuel dock and date of Jan. 1, 2017 and receive the answer of “2017-01-01, 11.61° E ± 0.33°” using the year 2015 World Magnetic Model. ​Or get the world declination software and make the calculation without an internet connection. 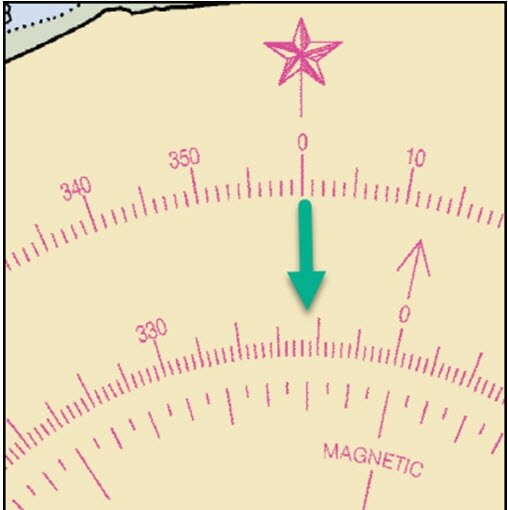 ​On the West Coast, Magnetic North lies to the East (right) of True North, and on the East Coast, Magnetic North lies to the West (left) of True North. 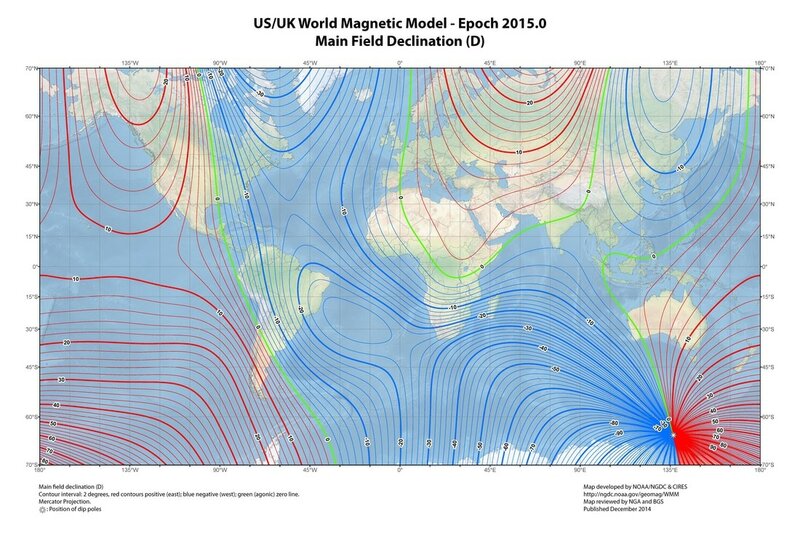 ​If this seems strange, look at the slice of world magnetic model (below left) and notice the green line running north and south through the Midwest of North America. In the diagram below right, imagine that T is the (true) North Pole and M is a place south of the North Pole on that green line. ​What might be confusing is that the compass rose on paper charts is actually two separate circles of directions. The outer circle has the zero degree line (5 pointed star) pointing to True North. The inner circle is the compass rose with the zero degree line (arrow) pointing to Magnetic North. Consider those two separate circles. 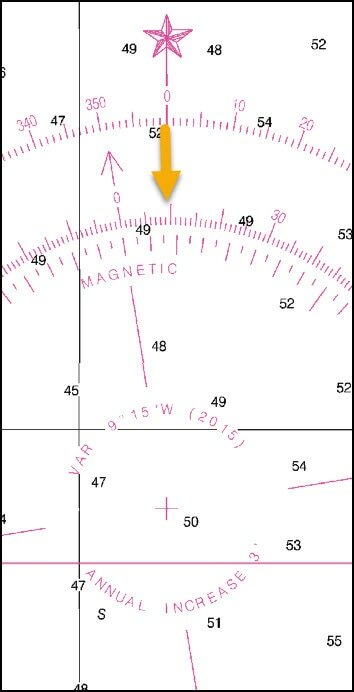 In San Diego (East Variation), if you start with True North at 0 degrees (same as 360) to “un-correct” to get the Magnetic equivalent of the same direction, you must subtract 12 from 360 to get 348 Magnetic shown by the green arrow below. 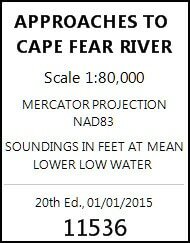 At Cape Fear (West Variation on East Coast) you must add 9 to True North 0 to get the the magnetic equivalent of the same direction. ​In San Diego, determine your desired course on a paper chart in True and then subtract 12 to get the same magnetic course to steer. If the helms person uses the compass to give you a bearing in magnetic, add 12 to get the same direction in True for paper chart plotting. You also must make an adjustment for compass error which may be different for each direction. This is called deviation. For Celtic Song, I had a professional swing the compass and prepare the deviation table which is kept at the Nav Station. The amount of deviation is so small that adjustment for it is unnecessary. 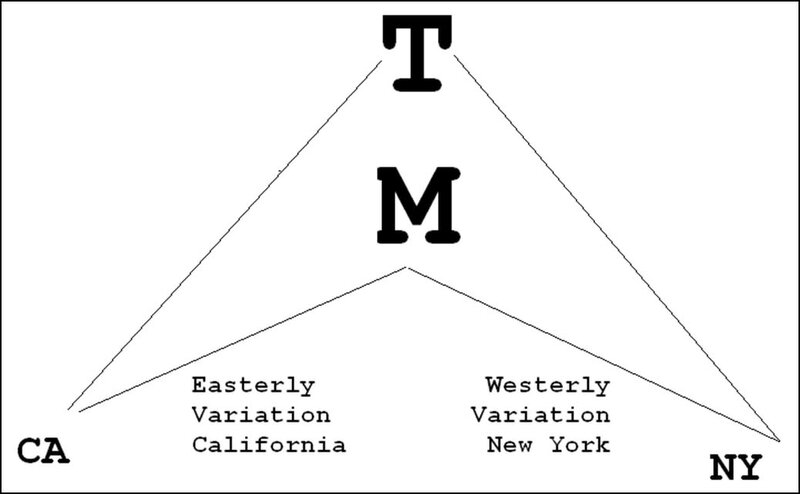 The rule — T-v-M-d-C, add West — which is memorized as “TV makes dull children , add work” means that as you un-correct from True to Compass, you add for west variation and west deviation while you subtract for east variation and east deviation. ​That’s what my father taught me at age 12: East is Least and West is Best, un-correcting. Obviously nothing is incorrect about a magnetic bearing, but the rhyme makes it easy to remember the mechanics of conversion from one point of reference to another. No small boat should cross an ocean without one or more crew members trained as medical officer. This is different from basic CPR or the first aid training of the 3 Cs: Check, Call 911, Care until ambulance arrives. At sea, you are the ambulance and the hospital. That extraordinary responsibility requires bravura mixed with humility. Fortunately, excellent training is available. The cool result of training is getting to correct thinking. That means knowing you can do much more to help than you might have imagined. ​Correct thinking also means knowing you can do much less to help than you might have wished. The resolution of this paradox is learning to distinguish one from the other. The process is a journey into medicine and into your own psyche to distinguish fear from arrogance. Think of the human body as a machine. With plenty of clean water, warmth, food, sleep and good social vibes, the body will work well most of the time. But In extremis: No oxygen = no life -- only minutes. Think methodically and keep notes about the whole system: Air goes in (not if under water) through nose and mouth to lungs (not if obstructed or muscles not working) into the blood (not if pressure too low –- causes?) bringing oxygen to (1) the brain (which tells heart and lungs to keep working) and (2) the muscles (which pump the blood and move the lungs). Understand the big picture so you can ask the right questions to methodically go through a check list to see what is wrong. Observe the crew. A talking active person who drinks enough water, eats and defecates, is not shivering, is coherent, and is within their own personality range is probably OK -- at least for awhile. Often in class a student would ask how long a human could live with some condition. Answer: “Five.” Next question: “Five what?” Answer: “I don’t know, minutes, days, years” meaning it depends on factors beyond your control and outside your knowledge. Other conditions were separated between deadly if not air lifted, and those not warranting the danger of an air lift. Keep the obvious in mind, but do not let it blind you from considering unexpected causes or multiple causes. 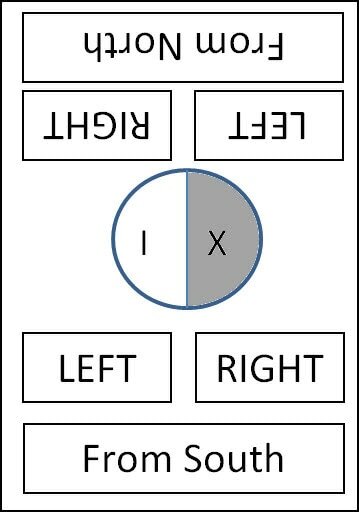 If you do not know how something should look, compare right side with left. While people come in different shapes, they are normally symmetrical. Remember, you are not the patient: (1) The pain of cleaning a deep wound is not your pain, but do not flinch from doing it properly while still comforting your patient. Your stress will only magnify the patient’s fear and pain. (2) With a conscious coherent patient, you may not do anything without permission. “I see you are in pain. I have some training, may I check your body for wounds?” If the patient says “no” explore why, but do not act without permission. Perhaps the patient wants to be examined by someone else. Say what you are going to do. Try to get to a “yes” answer. When you have permission, give yourself permission to let go of your own inhibitions. Focus on your purpose. No one wants a death because you were too embarrassed to do a complete exam. While you lack most medical tools and are neither trained nor licensed as a doctor, you can certainly gently and quickly pat a person from head to toe to disclose hidden injuries. You must also let go of your own revulsions. Learn to accept the sight of blood. Some wounds are messy, but if blood is not spurting out, blood is not by itself an immediate threat to life. Think mechanically. Stop spurting blood with hand pressure. Use washed hands, gloves and sterile gauze pads, if available. Loss of a little blood isn’t the larger concern, it’s the loss of blood pressure. Consider whether the patient is a danger to care givers because of Hepatitis C or other viruses transmitted by blood. Have this discussion before leaving the dock. Being at sea requires frank realism. With a week of home study before the three-day course, you learn that you can do a lot to save lives, offer comfort and a stronger recovery. ​You can handle many problems with limited resources. Others require years of medical experience and the machines and medications of a hospital. A goal of the Medicine at Sea course is to avoid unnecessary air evacuation at sea. Learn the difference between life threatening and scary looking. If possible, make radio contact with a medical doctor but know they may not understand your conditions at sea. Know that evacuation personnel thrive on the heroic thrill of doing their job. Your job is to provide dispassionate thought for your patient’s well being. In addition to response to trauma, Emergency Medicine at Sea teaches sailors to assess illness, including: infections of eyes, ears, teeth; abdominal pain; chest pain; gastrointestinal problems; respiratory infections. Air evacuation to hospital may not be possible or fast enough to save a patient’s life. Understand those life and death consequences. ​Encourage the crew to stay well with healthy eating, hydration, sleep, and proper clothing as well as remaining alert to danger and physical trauma. Those who will not or can not follow the prescription of the last sentence should not go offshore on a small boat. That would be unfair. You can handle many problems with limited resources. Others require years of medical experience and the machines and medications of a hospital. I see in Diane’s 3-4-2017 Blog entry: "Bowlines are great knots. But they do occasionally slip. Make sure you pull the knot tight and leave enough of a tail on the bitter end." It is only after the knot has been put under great tension of wind on the jib that the knot becomes “set.” Until then, inspect it often – especially as it alternates between tension and slack because that might cause the knot to come loose. In my experience, after many days of high tension use, the jib sheet bowline becomes so tight that it’s impossible to untie it with bare fingers. That is set. Finally, do your own research and gather your own evidence. 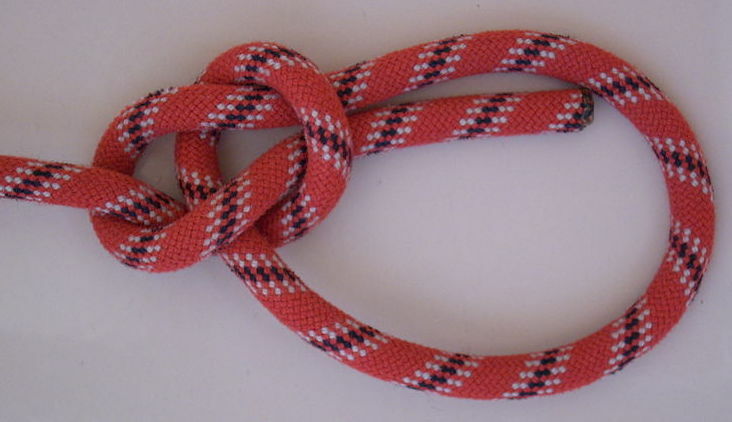 Be wary of conclusions about knots including this one. Discussion of knots is a slippery topic. 1. Outside Magazine discussion about what happened to a climber when a bowline came undone. 2. The Great Outdoors site reviews how the bowline performs in different situations. John Berol is the husband of Captain Diane. He commissioned Celtic Song in 2005, has sailed extensively and maintains an active interest in both the boat and her captain. He believes the more you know, the better you will sail. The term “Admiral’s Chair” is a family joke. For just as every writer needs an editor, so every captain needs an admiral.